Insulated glass, sometimes called by the old LOF trade name Thermopane, has been commercially offered in the United States since the 1950s. For the ensuing 60 years, the fundamental concept hasn’t really changed. Insulated glass still consists of two or more pieces of glass which are bonded to, yet separated from one another through the use of a spacer at all four edges. The space between them becomes an insulating “dead air space”. This sandwich is glued together with sealants designed to keep the glass together and moisture out. The spacer contains a dessicant that removes moisture which might be residual from manufacturing. Insulated glass seal failure occurs when moisture penetrates the edge seals and wets the airspace. The resulting assembly in its simplest form reduces heat loss by about one half over single glass. For you R-value fanatics, by insulating the glass, we improve the R1 of single glass and to a whopping R2 for insulated glass. When we add a Low-E coating, we can get about R3. If we then add argon gas in the airspace, about R4 is possible. A serious failure will involve the permanent presence of moisture in the airspace as you can see to the right. Animated glowing is just for entertainment and only occurs in real life when a cloud goes by very quickly, or during frat parties. The worst insulated glass seal failures I have seen also involve degradation of the spacer. Sometimes the spacer corrodes or even rusts. Sometimes the dessicant becomes so saturated that it turns to mush and becomes visible on the spacer. I have even seen a failure in which, upon deglazing, one lite of glass completely separated from the spacer. See this disaster below. Total Insulated Glass Seal Failure. One lite is completely delaminated. Spacer is rusting. Dessicant is overwhelmed. Water is present in the unit. Probable cause of failure: long-term immersion in water. There were no weep holes in the frame. When seal failures occur, the glass must be replaced. There are vendors out there who attempt to fix the failed unit by drilling holes in the spacer, forcing dry air into the airspace, and resealing the hole (or even leaving it open), but future failures are likely. In some instances the glass cannot be cleaned of the stain from the condensation. It’s hard to imagine the total failure shown above repaired without replacement. If any readers have experience with this process, or if you make your living performing it, please write in with your experiences. These ubiquitous spacers can be made from stainless steel or aluminum. Most are a rectangular tube in cross section, and the dessicant is inside the tube. Dessicant consists of tiny beads. Perforations in the airspace side of the tube allow moisture in the airspace to eventually migrate to the dessicant. Corners of these spacers are either bent or fitted into “corner keys”. This PPG invention reduces the flow of heat through the spacer by changing it from a tube to a channel. Dessicant is exposed to view in the airspace, and is a plastic. This new family of spacers uses a polyurethane thermal break, just like aluminum window frames. Two separate tubes carry the dessicant beads. This is one variation of “warm edge” technology, which means that on cold days, the interior temperature at the edge of the glass will be similar to the best temperature, considered to be at the center of the glass. I have not yet seen wide adoption of this design here so far. One manufacturer is Azon. They are a force in the thermal break market and naturally evolved their product to work inside the glass as well as in the frame. These spacers are a solid rectangular cross section of a plastic material that has dessicant entrained within it (Edgetech). Sometimes these spacers also contain a thin corrugated metal fin that assists in maintaining the dimension between the two lites (Tremco Swiggle). Sometimes these spacers are literally extruded right onto the glass edge in a semi-plastic state (Bystronic). Once the thermoplastic spacers are applied to one lite, the second lite is then placed, and the entire assembly goes through pinch rollers into an oven for fusing and curing. Thermoplastic spacers are considered to utilize “warm-edge technology”. 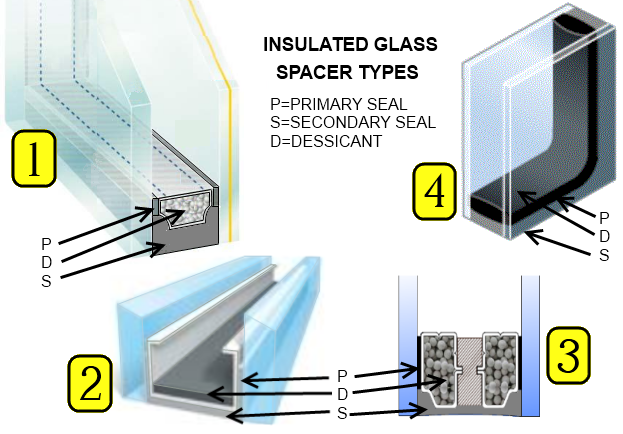 Dessicants are necessary in insulated glass units because of the near impossibility of sealing an insulated unit with perfectly dry air, and to allow for small amounts of moisture permeance during the unit’s service life. Generally, dessicants adsorb, rather than absorb the free-floating moisture in the airspace. In adsorption, the water molecules adhere to the surface of the dessicant rather than permeating into the dessicant as would occur in absorption. I really like the technical name for this process: “molecular sieve”. Cool, huh? The primary seal is responsible for keeping water out. The hands-down favorite for this seal is PIB, or polyisobutylene. It is a synthetic rubber that is gas impermeable, and so it is able to resist airborne moisture (water vapor) for many years if applied properly. If the primary seal fails, the result will almost always be condensation between the panes of glass symptomatic of insulated glass seal failure. The job of the secondary seal is to hold it all together. Strength, flexibility and a strong adhesive bond are essential. 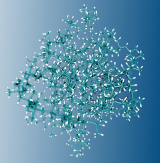 Polysulfides, a family of carbon and sulfur-based synthetic rubbers have been used for many years. In the last few decades, silicone sealants have experienced increasing popularity. Silicone is similar to quartz, except that some of the oxygen molecules are substituted with carbon-hydrogen groups (methyl – CH3). to create long strands of flexible, durable material. Both have two-part rapid-set versions for factory production use. If this seal fails, the primary seal can easily become disrupted, bringing about the fogging associated with insulated glass seal failure. One key element of seal longevity is edge deletion. This is the grinding off of coatings such as low-e coatings for a stripe along each edge to allow for direct adhesion to the glass. Edge deletion also keeps the coatings, which are metallic, as far away from the outside air as possible to avoid the possible creep of corrosion beneath the adhesive bond line. Sealant Reversion – the sealant decides to revert back to its prior form or degrade into a totally new and useless form, that is, if the sealant could “decide” things. Why does seal failure occur? If the failure occurs within the first few years, there was an error in manufacture or installation. The manufacturer may have used old material or failed to properly mix or apply the sealant. The glass unit may have been moved too soon, disrupting the seal before sufficient cure. There may be sealant incompatibilities between the various sealants, even the setting blocks, used in the glazing system. The manufacturer, shipper or installer may have punctured the seal at any point along the way. Insulated glass destroyed by long-term immersion in water. If the seal failures occur after a couple of years following installation, it’s time to look at the drainage system beneath the glass. Weep holes are notoriously absent from most wood and wood-clad windows and even some aluminum windows. As the glazing seals (between glass and adjacent frame) loosen up, water enters that area and accumulates beneath the bottom of the glass. Without a “weepage path”, this is DOOM, do you hear me? CERTAIN DOOM!!! Doom that could have been avoided if the manufacturers designed a way for the glass to drain. Insulated glass seals are not designed for immersion. These are not aquarium sealants. In my humble, unbiased and completely objective view, absence of a weepage path beneath the glass has been the single most glaring, persistent weakness in window products since the advent of insulated glass. If you have been a victim of this design/manufacturing shortcoming, I hope you will contact me. Need a glass consultant for a problem with fogging glass, foggy windows, condensation between panes or insulated glass failure? Mark your website is amazing, so much on there, so deep. You are doing an absolutely great job! Suite 100 Video & Communications, Ltd. I know that with your extensive background in video production, you have full appreciation of what goes into this. Thanks also for the seal footage. I must say I was relieved when it remained G-rated. Can I post your comments on the site? I want to show everybody that I have at least ONE fan! Thanks to my lovely and very talented sister. I enjoyed reading all of this post – enjoyed because it is thorough, but clear and concise and has no obvious bias or gimmick to sell. Well done. This is the first of your blogs that I’ve read and it won’t be the last. Certainly there’s a lot more that could be added (at the expense of “clear and concise”, for sure) and I suspect you kept things simple on purpose. But, let me add a thought — Based on my recent experience with a former employer that fabricates glass using “Suspended Coated Film (SCF)”, I recognize how important edge seals are when the IG units have multiple layers. It’s obvious enough with triple layers of glass, yet the alternative design using SCF adds another wrinkle (pun intended!). Correctly made SCF glass does NOT wrinkle or distort as long as the secondary, structural sealants are designed and placed to resist the tension that keeps the film taut. The dynamic forces at play on spacers and edge seals are separate topic worthy of discussion. Our home is going on seven years and we have about five windows that are fogged. The windows are aluminum framed double pane, with the symbol GA on the window opener levers. Can’t locate the installer, probably out of business. Anyway wanted to know if just the glass can be replaced and not the window frame since that would involve taking off outside stucco, etc. The bottom window goes up and down but top pane is fixed. So can a glass company replace just the glass and upgrade to argon gas. Always wanted to know what would happen if we broke the window with a baseball or something else. Do you have any idea what the replacement glass will cost? The perfect day to have great insulated windows that are sealed right! Yes, Suspended Coated Films are a big topic. The most well known of these is the Heat MirrorÂ® product by Southwall Technologies. There are 14 window companies listed at Southwall’s site that use Heat MirrorÂ® in their windows. Heat MirrorÂ® is a celluloid or polyester sheet suspended inside the insulated glass airspace, separating it into two or more airspaces. One thermal benefit comes from this separation. The film itself has a low-e coating, thus providing another thermal benefit. Spurred by the US Department of Energy, SCF’s are undergoing a new wave of development. Some companies are already providing glass units with multiple layers of SCF. A big benefit of this approach is that SCFs are much lighter and thinner than the other alternative, which would be additional layers of low-e glass. As you more than inferred, the sheet must be held taut so that it is invisible, and the need for this applies a new stress to the edge seals that would not be seen in a vanilla insulated lite. I invite anyone with experiences with this technology to share what they know. And thanks to Alan for his valuable posting. Since your windows are not very old, they may still be under warranty. The GA is a clue – General American? Georgia window? Also, look on the insulated glass spacer inside the glass at the edges. These often have manufacturer markings. I am puzzled by your description of “window opener levers” on a single hung window. Would be interested in a picture of that. Most aluminum windows are readily reglazable, provided that you know how. Hung sash frequently use “marine” or “wrap-around” glazing that requires disassembly of the sash in order to reglaze. Your lower operable sash is probably like this. This is not as bad as it sounds. If the glass is fixed like your upper lite, there is probably an extruded stop on the inside that can be removed in order to reglaze. An experienced glazier will be able to remove this and reglaze for you. As for cost, that will vary quite a bit, influenced by the glass specification you want, the local labor, and the quantity you are ordering. Get at least three prices and do all of the fogged units at once for your best deal. Send me a pic of the lever! 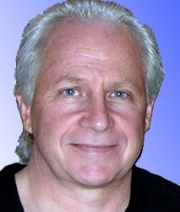 Bill Wood here, 20 yr. Home inspector in the Detroit market. Included pic is representative of every window in a 5000 square home. Only three windows are fogged. What can my client expect? My guess is inevitable failure of the glass throughout. How old is the house? Do you know window manufacturer? I can come and perform the ASTM E576 dewpoint test to measure moisture in the airspace. That type of spacer appearance should be consistent with poor results in ASTM E576. The spacer appearance, combined with the test results should be persuasive in a warranty claim. This article is very interenting and remind me a lot of cases I have seen down here in Monterrey, MÃ©xico. I am interested in translating this article and deliver to my costumers and this is to ask for your autorization to do that with mi offer to give you explicit recognition as the original writter. Thanks in advance for your answer and I will keep in touch. As a home inspector of 15 years and seeing numerous window types and manufacturers. I have seen total failure in homes less than 5 years in 100% of the windows, wet rot in various wood clad designs to no visible defects in windows older than 20 years. Regardless of the age and conditions, clients have an expectation that once inspected and “passed” that they will stay that way for ever. If you were a home inspector armed with no tools, your wits, experience and performing a visual inspection of the vinyl windows on a 12 year old home while following the National Association of Home Inspectors Standards of Practice (http://www.nahi.org/web-nahi-standards-of-practice.pdf), what would or could you typically look for. What standard of practice would you write or like to see occur in my industry? This article as to the real cause of insulating glass seal failure is very helpful for me and my customer in Korea. kd is right don’t remove it! if you have aadelry removed the broken glass and the existing glazing compound (the stuff that makes the bevel holding the window in the sash) just measure the height and width in a few places because the sash may not be square, buy new glass and glazing putty and you’ve got a new window! I had new insulated double hung windows installed 15 years ago by a company that is no longer in business. They are fuse welded. The problem I have with some of them, now, is that the rubber insulation that wraps around the window between the panes is starting to loosen and bowing in towards the center of the window. I don’t have any condensation problems , yet, but would like to fix this. I am a competent handy person that wants to replace the IGU’s, myself. I’ve seen the videos of replacing the IGU and it looks pretty easy. Where can I order new IGU’s to install in my windows in Chicagoland area? Thanks! Mark: Enjoyed the information on IG. I have a client that has relatively new (5+ years)mahogany windows with IG. The IG has swiggle as the separation. A few have fogged, but probably less than 3% of the panes. These are true divided light windows so there are a lot of panes. If the swiggle is slightly protruding into the vision area, is this a sign of problems to come? Are these windows expected to fog soon? Is this an early warning sign? Or is this a typical occurrence with swiggle. I don’t know who made the swiggle. Intrusion of the Swiggle spacer is a symptom of poor quality control, and that may or may not lead to premature failure. If the spacer intrudes in bulges over 1/8″, see if the bulges coincide with setting blocks or edge blocks. If so, chances of failure are pretty strong. Can it be? A Google search that responds with an authoritative page at the top of the list? Thank you, Mark! As an engineer, I can relate to your explanations and use them comfortably. As you may know, in the world of physical asset management, debate abounds about failure states. A fogged window is clear evidence of a failed window system. But what about the gradual (over a span of about 10 years) appearance of sealant at the top of the window frame in an otherwise pristine window? One could argue that if the asset is the sealant, then it is clearly in some failure state. But what about the window system? If the window still allows light in, allows people to see out clearly, has no measurable loss of heat transfer resistance, and continues to keep uninvited things out, then the window system has not failed. In your opinion, is that a valid argument? Sealant failure, such as oozing, liquefying or staining of sealants are valid failure modes. This not condemn the window system, just the sealant. And hopefully it can be removed and replaced. 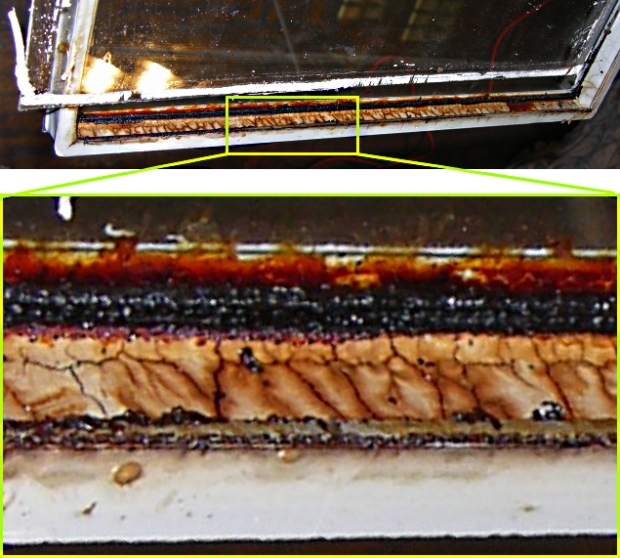 I have a situation that is similar to what Peter B is describing in which 6 year-old dual pane insulated low-e windows have a brown substance oozing from the top of the window but between the two panes of glass. But it appears that the primary seals have not failed as we have no moisture between the two panes. Would you agree that this should be covered under warranty? It sounds like reversion of the primary seal. I would call it a seal failure and try to get replacement under the warranty. I’m in an apartment, and this summer was very hot. I’m noticing a black tar-like substance oozing out of the sides of the windows and its basically ruined the walls and all of our blinds. It’s very sticky. How can we clean it ? I have a client who put IGU´s in windows made of Siberian Iarch wood. After two years primary sealant of IGU´s starting to leek and squeeze. At first I thought the client used acidic silikon instead neutral but when I convinced he didn´t the only thing that falls to my mind is maybe some chemical reaction from the wood. My client also claims that he used a water based paint for wood. What is your opinion in this case? I hope you can help with the problem I have? I got 193 units QUAD SC75 with Heat Mirror film and filled with krypton produced by ECO Insulating glass Inc, 1416 Bonhill Road Mississauga. Excellent article. Thanks for taking the time to publish this. Glass seal failure is very common here in Colorado. As a home inspector, I observe this issue several times a month. Would it be okay to include the URL for this atricle in my inspection reports? This article would be helpful in explaining the issue and the best way to fix it; total glass replacement.